The Mauve Brigade embodies the way of life of the jolly swordsman, making his or her way through life with humor, bravado, and sometimes-questionable morality. Almost any blade is lethal in the hands of a member of the Brigade. Cleverness and wit gain as much prestige as sheer fighting finesse and style in this loosely-bound organization of cutthroats, pirates, rakes and shovels. A love of adventure and sense of recklessness binds these souls together. Members of Mauve are known to parry blows of their opponents and disarm enemies with deft swipes of their blades. They are admired for their showy and reckless ability to smite a foe with their blade. All members of Mauve cherish blades as their preferred weapon and will instantly revoke membership of anyone who taints their good name by using an inferior weapon. 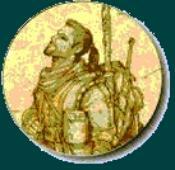 The Rangers of Threforfar are a tightly-knit gathering of woodsmen and brave adventurers of the frontier. While others stomp through the woods and trails in search of enemies, the rangers glide through their surroundings with grace and ease, making nary a sound. The Rangers are one with the land and the land of Igor provides for the daring Rangers of Threforfar. The rangers are able to create healing salves from the earth and can forage for food in the wild terrain. They can also summon falcons and other such creatures to help themselves and those they call friends. Rangers often delight and amaze the citizens of Igor with their ability to whittle almost any creation out of a small block of wood. All those who wish to join the loyal and helping Rangers must complete a quest to prove the worthiness and dedication needed to become a proper Ranger of Threforfar. In the deep and dark reaches of Igor thrives the most sinister of cults to set foot upon the soil. The mere mention of The Blue Order strikes fear in the hearts of many. The members of this cult are known to summon evil creatures to fight at their side and to toss bolts of unholy light at their enemies. 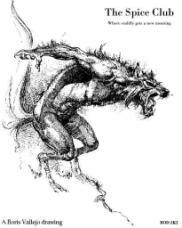 With a word they may cause a monster to stop fighting with a weapon and they revel in their evil and foul deeds. The Blue Order is a mar upon the surface of Igor and the cult celebrates its evil stain. All those who wish to bind their souls to the cult must be of an evil alignment. After entering the cult, members must maintain their evil status or be thrust out into the light. The Loremasters are a guild of scientists and general technological bunnies. Magic isn't something that they know a lot about, and so Loremasters have very little need of spell points for their abilities. Instead, a pool of Loreskill points is used to create the widgets that the guild members are famed for. Loremasters are not powerful in combat, preferring to use their skills in creating a strong defence. We are also playful, creating toys for sheer amusement and fun. There are no restrictions for members with regard to good, evil or neutrality alignments. In combat, Loreguild members have been seen creating several images of themselves, confusing their victims; they have produced replicas of weapons they wield; they have even been known to subject themselves to the effects of mind- and body- altering drugs. At other times, small robots have been observed, following their masters faithfully. When all else fails, they vanish in the twinkling of an eye. Since the creation of the universe Light and Darkness were battling for the ultimate rule in the world. Everyone was involved to a certain extent and no one ever believed that there could be a third force in the world equally important. But then - one ordinary day - the third power introduced itself to a man called Victor who lived in a small village called Panhold. And the power is EQUALITY, the power of the balance between Light and Darkness and Victor was appointed the first SPIRIT of EQUALITY – as the members of this new force are called. The power of the Spirits is the balance amongst their members. Only little mental strength is needed to use their spiritual powers, when the world of the Spirits is fairly well balanced. Those who want to become a spirit go to Victor and let him know. He then introduces them to the powers of Equality if he finds real balance in their souls. The steadfast and stalwart KNIGHTS of BATH do battle against the hordes of evil that infiltrate the blessed land of Igor. Although they are strong in their faith, they maintain a sense of humour against the Darkness that exists in the land and in our souls. The members of the Bath are known for their fighting prowess, their super magical hammers and their wondrous ability to heal. The Bath is a steady hand that strengthens the land of Igor. All knight recruits must be of a good alignment and once accepted into the ranks of the Bath must keep their good alignment. Where “cuddly” takes on a whole new meaning. The Freedom Fighters of Foyrexia (AKA 'The Rebellion', or 'FFF') is a close-knit group of Rebels. They represent the last hope of all people in the heroic effort to defeat the evil Count Vectras and win everlasting freedom. Foyrex, the Warrior King, leads the rag- tag group, most of whom are the survivors of the "Battle of the Dead." The FFF is based on loyalty - loyalty to Foyrexia, loyalty to the goal of Vectras' defeat, loyalty to the members of the Rebellion, and above all, loyalty to the ideals of FREEDOM. All members of the FFF are committed to the cause, and they pledge their lives in this never-ending quest for victory!!! The Rebellion is an Igor-wide group, but its fight is mainly in the Great Lands of Foyrexia, where Count Vectras has established his terrible stronghold. This wonderful country has many beautiful places, and many dangers, and the FFF fights to bring about its freedom for its people, as well as for all the people of Igor. The TerrorTeam is a club run by players for players. The Terror Team structure is based on positions (duties/roles) and quest completion. It is based on Boy’s Island of Terror. Terror Island currently has three (rumoured to be four) quests to be completed. Each of these challenges grows more difficult as you advance. When you complete the first quest (known as the Spirit of Terror) you are automatically made a member of the Terror Team. The subsequent quests are optional but they raise your status, and abilities, within the team. When (if) a member becomes a Wizard, their TerrorTeam status is carried with them. Tigger Defenders are a subset of the TerrorTeam. 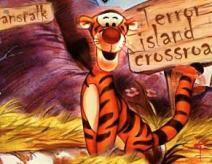 The Defenders look after Tigger, the Terror Island's mascot. When Tigger is attacked by a player, he can telepathically send a message to any Defenders who are currently playing the game. A Defender will then come to Tigger's rescue. Defenders have powers to heal Tigger, helping him to defeat the dastardly attack. Only five players can be Defenders at any one time, and they are chosen by the President of the TerrorTeam. IgorMUD has a number of groups we fondly call Families. Some of the groups are well developed and have a long lineage, others are very informal. They all, however, accept players into their midst by invitation only. As you explore Igor you’ll probably meet a few of them, and perhaps be adopted into one of their homes. The Edrackel family was formed 6 years ago, founded by LJ and Lotta and their MUDson Garlix, and Axia, the family’s mother. There is no motto, no crest, no website to describe this tight knit family. Their members have all come together as a family for the same reason – they were all outsiders looking for a place to belong. Possibly not the biggest family, or the oldest, Edrackel claims only to be a family. The Thraeryns are one of the greatest and most prestigious families on Igor. The family was founded by Ranishat Ren, His Majesty Thraeryn, and quickly grew by leaps and bounds. The Meowers is a family of cats! This is a unique family in that you can be a member of this family as well as one of the others at the same time.